I can only review half of the movie Ouija: Origin of Evil, as I spent the other half hiding behind my hands. The movie takes place in 1967, Los Angeles and captures the lives of widowed mother Alice Zander (Elizabeth Reaser) and her two children, Lina (Annalise Basso) and Doris (Lulu Wilson). The film follows around Alice who supports her family by pretending to be a medium with the help of her daughters to trick people into thinking they are in contact with the dead. This takes a turn for the worse when Alice brings home a ouija board to further enhance the act and Doris, aged eight, ends up having an affinity for it. Doris’s antics end up inviting some nice and some not-so-nice spirits into the house. Some innocently relay their messages to the living, while others take advantage of Doris’s gift and used her body for their own purposes. Director Mike Flanagan did well to keep the audience in suspense throughout the film by using expertly timed cut scenes and leading music as well as utilizing a chilling script and multiple jump scares. All of this combined to have me jumping so often most of my popcorn ended up on the floor rather than my mouth. On the other hand, Flanagan’s use of silly over-the-top demons that were excessively computer generated failed to truly frighten. What started out as a great horror flick lost its originality and scenes fell flat as Flanagan resorted to gimmicky possessions similar to those in The Exorcist by William Friedkin. The cringe-worthy possession scenes included a spider like Doris that could crawl up walls with blank pupil-less eyes and an unhinged jaw. This movie gets three stars out of five on its level of horror. For a film with an almost five million pound budget, it did well to scare me in the moment but could have done better. This film proves that a higher budget doesn’t necessarily lead to a higher quality film. A great example of a good scary movie with a low budget is Paranormal Activity, which was produced on a nine thousand pound budget and managed to scare me so much it affected my sleep for three nights. Our imagination can do horrendous things to us, Flanagan missed an opportunity to thoroughly scare us by showing us in detail what should have been kept in the shadows. 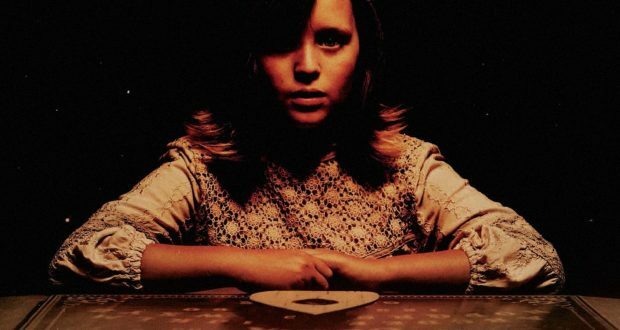 Ouija: Origin of Evil is a prequel to the movie Ouija released in 2014. You do not have to see the original movie to understand and follow along with this one, it stands alone well. This movie did scare me in the moment, but the fear did not follow me home.